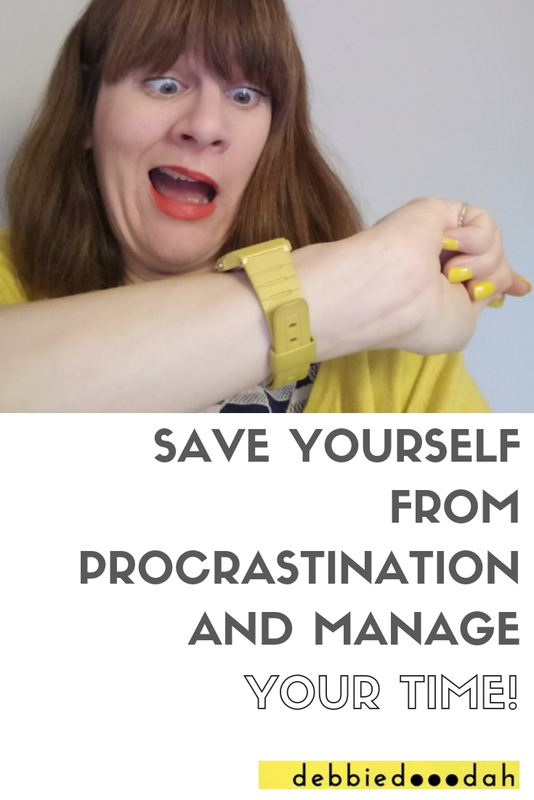 Save yourself from Procrastination and manage your time! Following on from last weeks post talking about the 4 hour week I wanted to investigate and share some tips I have for time management. So if you do decide to work 4 hours a day you have some tools to help you make the absolute most of it. But first of all, I wanted to talk about the nemesis of time; Procrastination. Because what eats into our time at work isn’t our children, or the washing up. They’re at school or could be done later. It’s generally procrastination that eats into our dedicated work time. So what is it and how can you save yourself from it? Imagine a scenario where you’ve a whole heap of things you should be doing. A product you want to launch, a press release to write, a client to call, but somehow you always find something more interesting that needs to be done. That’s procrastination; avoiding what needs to be done. I think we procrastinate for 3 reasons, and by naming and shaming these reasons, we’ll hopefully be on the path to getting more things done! You’re scared that if you do x, you’ll become successful, you might actually make some money, lots of people will want to work with you and you’ll somehow change – and that’s scary. So, you’d rather just stay where you are, comfortable (even when it’s not comfortable), because at least you know how to deal with this reality. You’re scared that if you do x, you’ll fail. If you actually make a real go of it and then it doesn’t work out and fails, where will you go next? Everyone will know you’re a failure and your dreams will be dashed. So better to look from afar at what could have been, and know that you didn’t really try, so if you fail it’s not really your fault. What if you put all that effort it and no-one wants to buy it – that can seem worse. You don’t actually like what you’re doing and you don’t want to do it. You just haven’t admitted it to yourself yet. So, before we even start talking about time management, you’re going to have to take a good hard look at why you might be procrastinating! Firstly look at your task – is it a massive thing that needs to be done? Can you split it into smaller things? When we’re looking at something that seems insurmountable, it generally is and we want to run from it. Slowly, slowly put the camel in the pot – you can’t eat a camel in one sitting. So you need to break it up. Then you can eat the camel. Break those big tasks into small tasks that are more manageable. I like to use excel to map out really big projects. I assign a line to each small task and then a month I’m going to do it. Then I change the colour from green (not yet done) to red (done). Very satisfying. I tend to only work in 90-day chunks – see the tips on 90 goals below. Work out what you need to do. It’s probably going to be a massive list! Are there things that can wait until next week, or even next month? Take those off your list and add them as a diary entry in your calendar for when they need to be done (so you don’t forget). Are there things on your list other people can do, or even that don’t really need doing? Take them off and pass them over! What can you achieve today? If you’re only working 4 hours – it may just be one thing or 4, but definitely not 10. I write down every half hour I’m working and then work out what tasks I can assign to what 30 min slot. Don’t forget you’ll also need to factor in time to read emails and do some social media in your day. Do you find yourself distracted flicking from website tab to website tab? From email to Facebook, to a blog, to your google analytics? By block booking tasks you’ll make sure that you only do that one thing. Multi-tasking is a fallacy, forget it. Get focused instead! I make sure I check emails first thing in the morning and then lunchtime. I block out 20 minutes in the day to manage my social media. And maybe 20 minutes in the evening to catch up on Facebook groups and replying to people who’ve contacted me. Pick a task, set your timer for 20 minutes and get on with it – no distraction! After 20 minutes walk around, make a cup of tea and then repeat. Really focuses the mind! What would you like the achieve in 3 months’ time? What tasks do you need to do to get there? I find looking ahead any further hurts my brain. But 3 months is manageable. You may have an overall how I want my business to be in 3 years plan. But focus on what you can achieve in 3 months. It will make it seem more manageable and put those procrastination thoughts to bed. Are you spending lots of time looking for files online or that magic pen in your office? Spend half a day clearing out your space virtually and online. Make sure things you need daily are within easy reach. You’ll save yourself some time! Want to learn more about working a 4 hour day? Or learn how to work smarter?